Google Cloud Platform Blog: We’ve moved! Come see our new home! , and now, we’re writing our last at this particular web address. Today, it’s with great excitement that we present to you the Google Cloud blog, your home for all the latest GCP product news, how-to’s, perspectives and customer stories that you’re used to, all living happily on a shiny, new mobile-friendly platform. We’re really excited about this change. 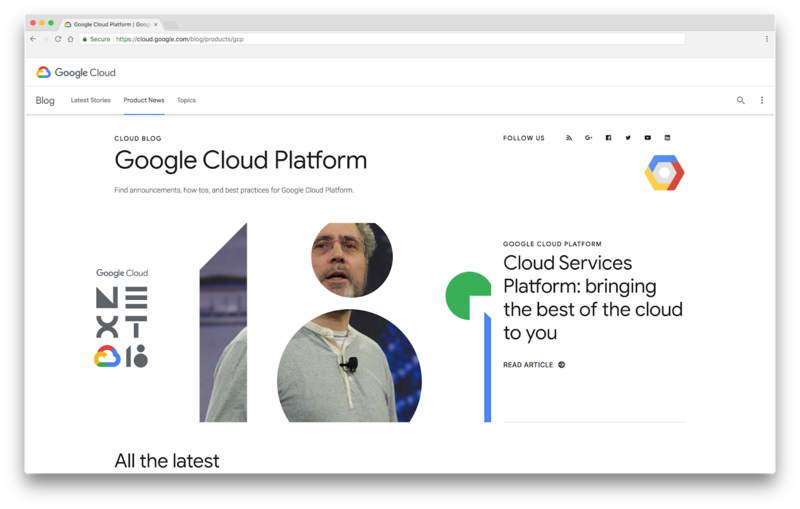 Not only does the new blog look really nice, but it includes all the content from across the entire Google Cloud family—GCP, G Suite, Google Maps Platform and Chrome Enterprise—so you can see how they all fit together. And because data analysis and artificial intelligence are so central to everything people are building today, we’ve also folded our Big Data and Machine Learning blog into this new platform. Besides collecting all Google Cloud blog content in one place, we think you’ll really benefit from the blog’s rich tagging capabilities. Now, you can view blog posts by platform, and also drill down to specific technology areas like Application Development, Networking or Open Source, so you can quickly find related content. There are also dedicated pages for partners, customers, trainings and certifications, and solutions and how-to’s, to name a few. And because we can also tag posts to multiple products and topics, you’ll be sure to find what you’re looking for. Those are just the high-level changes. There are a whole lot of new features to use and explore, and we encourage you to browse the site and get familiar with it. What’s not new is our mission: to provide you with honest, technical content to show you how to build your business on GCP. To date, we’ve migrated over two year’s worth of GCP blog posts to this new home, with more to come. Let us know if you find any broken links, typos, or just flat-out missing content. And of course, we’d love your feedback on our content, the design, or any features you’d like to see. Thanks for reading! Ten years, three months and 30 days ago, we wrote our first post on this blog, and now, we’re writing our last at this particular web address. Today, it’s with great excitement that we present to you the Google Cloud blog, your home for all the latest GCP product news, how-to’s, perspectives and customer stories that you’re used to, all living happily on a shiny, new mobile-friendly platform.